You've come to Ken Brown’s “gardening-enjoyed” site looking for information on creating gardens. Welcome! There is so much to talk about. Creating a garden can be anything from a small succulent container or a strawberry pot of herbs to planning and planting a large estate. I’ll try to lead you from here to a variety of different aspects of creating a garden. I’ll lead you down the garden path and show you the various parts of my garden and even how and where, to create the garden paths. 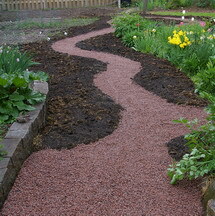 There will be straightforward areas such as planning and planting your first vegetable garden. I’ll let you watch as I attempt some really weird and wonderful gardening techniques such as trying to grow a Wisteria vine as a small tree. 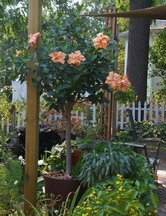 I also will give you my tips on some of the more common exotics such as the Hibiscus tree that we keep on our patio so that we can enjoy its magnificent blooms all summer. Where, when, why and how, to use the two main types of flowering plants. Perennial flowers make a wonderful long lasting and diverse flower border. Annual flowers for me are not an alternative to perennials but rather have many other uses in the gardens. Come back here often to see my latest good advice to beginners or to see what weird and wonderful project I’m attempting in my garden. You can search my entire site for answers to your other gardening mysteries.